Nutrition is an interesting topic. For some, they treat it like religion. But it isn’t like religion at all. It doesn’t matter what I believe. Instead what should matter is what the research tells us to be true. We can decide to accept science or not. Serious About Weight Loss? Stop Reading Food Labels! I might be contradicting myself here but it’s got to be done. ‘How so?’ you might be saying to yourself. Well for a while I was encouraging you to do something nutritionally that I believed was in your best interests. That would give you better results related to weight loss and performance. What it is that I had you doing was reading food labels. So how can this be a bad thing? Why would I suggest you stop doing so? Well for three reasons. So how are these titles on packaging misleading? Well there really is no benefit to eating real sugar. It still causes an insulin spike and puts the break on your fat burning. What about ‘all-natural’ and ‘organic’? Well just because something occurs naturally doesn’t mean it’s healthy and a good idea to put it in your mouth. Heck, in the case of arsenic, it can kill you. And organic, well often times this is marketing-hype imo. If you eat organic for environmental reasons, do organic bananas leave a smaller organic footprint to ship to Canada than regular bananas? 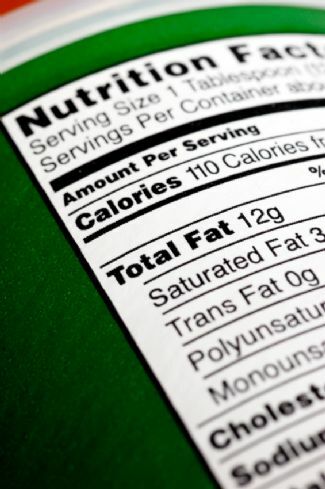 Ask most people what they check when they read a food label and what is the most common answer? Calories. We still believe, incorrectly, that a calorie is a calorie and we simply need to create a deficit or surplus in order to have the best results. The truth is that it’s probably more important to consider the quality and timing of your food selections rather than the calorie count. Knowing this, and the fact most people don’t check the sugar, protein or fibre content on labels means they could probably save themselves the effort. If the majority of the foods you eat don’t have a label, good for you. This means you are probably preparing most of your meals yourself and eating better quality nutrition than the masses. Because it really is a contradiction to be trying to have the healthiest life possible when we’re comparing the labels on ice cream at the super market. Or when we buy 100 calorie size samples of chocolate bars to manage our cravings. We’re fooling ourselves if we read labels for any of the above three reasons. However if you read labels to seek out essential nutrients or if you read labels to ensure the absence of gluten, HFCS or some other ingredient than carry on. Otherwise quit reading food labels and enjoy the benefits of optimum health, fitness and performance. Hi there: Last weekend we met for our weekly stairs workout. Everything was as per usual leading up to the workout. Rest was good. Motivation to train was good. I had hydrated well before the workout and had breakfast before training. As we showed up for the workout we began with a general warm-up consisting of an easy jog around the soccer fields. From there we went into our dynamic warm-up, some skip drills and then a short jog over to the stairs. After a few leg swings and some ankle mobilizations we then proceeded to walk up the first flight of stairs. By the top of the stairs everything was feeling loose, warmed up and ready to go. But I wasn’t feeling too hot. I wasn’t sure why but thought the feeling would pass. So we proceeded on with the workout. And I was having difficulty getting my legs going. You know the feeling I’m talking about? Even though you’ve gone through a thorough warm-up your body still feels sluggish. Well that’s how I felt. Add to that my heart rate was at or above the normal level for this type of workout. Then I realized what I had done wrong. The day before I had made an omelet. And whenever I cook I like to make extra on purpose. This saves me time then next time I go looking for something to eat. So when I woke that Saturday morning all I could think about was the left over omelet calling to me from my bed. 3 eggs, a good dose of shredded cheddar, more than enough bacon with some peppers. After getting ready I was in the kitchen warming up these left-overs and looking forward to my pre-workout meal this omelet would make. I should have known better. When we load the body up on fat, protein and or calories we divert blood from the working muscles to the GI tract for the task of digesting these nutrients. And I had just incorporated all 3 of these into my pre-workout meal. In terms of carbs, protein, fats and calories here’s how this meal looked. I struck out in all three areas of my pre-workout nutrition. I had way too much protein, fat and calories. And zero carbs to fuel my efforts. In fact my fat intake was over 70% of my calories for that meal! (it should have been around 30%) And almost 600 calories won’t sit well in anyone’s stomach right before a workout. But when you think about it many people will make this same mistake. They will assume an omelet is a healthy breakfast option. They would guess that eggs and cheese are both good food sources and that bacon once in a while can’t be that bad. And they’d be right. The key considerations here are the proportions of carbs, protein, fats as well as the timing of the meal. Obviously my proportions were unbalanced, I ate too many calories and I didn’t eat this meal at a very good time considering the workout I was about to do. While we often perform a stair workout to drop a pound of two stick to the conventional way of doing so and don’t follow my lead of tasting your breakfast a second time. Do you have a favourite pre-workout meal? Leave a comment and let me know what works for you.